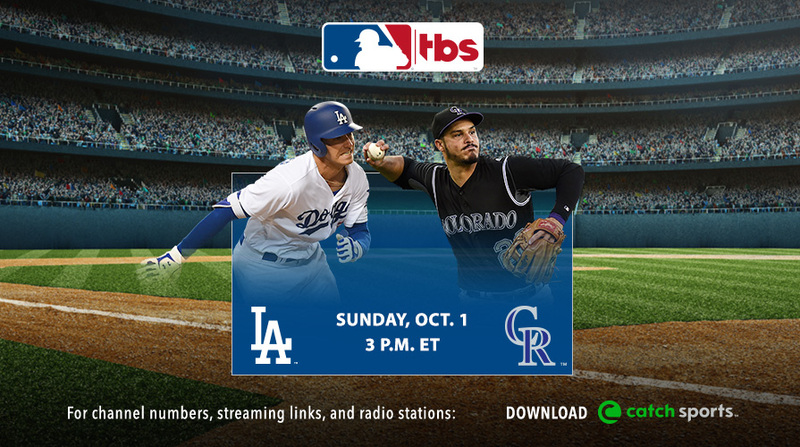 MLB on TBS will feature live game action with postseason implications on the final day of the regular season as the NL West Champion Los Angeles Dodgers and rookie sensation Cody Bellinger visit the Wild Card contending Colorado Rockies and MVP candidate Nolan Arenado, Sunday, Oct. 1, at 3 p.m. ET. Ernie Johnson (play-by-play) will be joined by analyst Ron Darling to call the telecast. Following Sunday's regular season finale, TBS will be the exclusive television home of the National League throughout the 2017 MLB Postseason, beginning with National League Wild Card coverage on TBS presented by Hankook Tire on Wednesday, Oct. 4, at 8 p.m. ET. • The MLB Postseason Pre-Game Show on TBS will return on NL Postseason game days, beginning with the network's NL Wild Card coverage on Wednesday, Oct. 4, at 7 p.m.